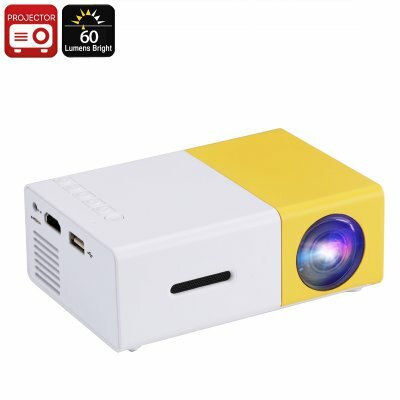 Successfully Added Mini LED Projector - 60 Lumen, Manual Focus, 24W LED, 60-Inch Image Size, DLP Technology, RGB LED Light Source to your Shopping Cart. This mini LED projector is a cool electronic gadget that is perfect for any child’s bedroom. It features a sufficient 24W LED lamp that effortlessly portraits images and movies onto your wall. Thanks to this, you’ll be able to turn any dark room into your private cinema. It comes with a manual focus which means that you’ll always be able to enjoy sharp and clear images. Whether you like to share your holiday pictures or watch a movie – this LED mini projector will meet your demands. With a service life up to 30,000 hours, you’ll be able to use this beamer for years to come. This LED projector is sure to bring hours’ worth of fun into the lives of all movie lovers out there. With its 2-meter projection distance, this mini projector is a great to be used in smaller spaces. Whether you use it in your living room or to pimp up your child’s bedroom, it is sure to bring along plenty of entertainment. The projector produces merely 25dB of noise. This means you’ll be able to enjoy your media without being disturbed. Featuring a 60-inch image projection, it truly lets you enjoy a cinematic experience from the comfort of your bed or sofa. This mini projector features DLP technology. This means that you’ll be spoiled with deep colors and high details anytime you project something on your wall. The DLP projector furthermore supports HDMI and AV inputs, meaning you’re able to hook it up to your PC or television set. Additionally, it supports a TF card and USB input. Thanks to this, you’re able to carry along your projector and media anywhere you go. Whether you’re at home, visiting a friend, or staying over in a hotel – this portable projector allows you to enjoy movies anywhere you go. This Mini LED projector comes with a 12 months warranty, brought to you by the leader in electronic devices as well as wholesale electronic gadgets..
Arabic: - جهاز عرض صغير - Chinese Simplified: - 迷你投影仪 - Czech: - Mini projektor - Danish: - Mini-projektor - Dutch: - Mini Projector - French: - Mini projecteur - German: - Mini-Projektor - Hebrew: - מקרן מיני - Hindi: - मिनी प्रोजेक्टर - Italian: - Mini proiettore - Japanese: - ミニプロジェクター - Korean: - 미니 프로젝터 - Malay: - Projektor mini - Norwegian Bokmål: - Mini-projektor - Romanian: - Mini proiector - Russian: - Мини проектор - Spanish: - Mini proyector - Thai: - โปรเจคเตอร์ขนาดเล็ก - Turkish: - Mini projektör - Vietnamese: - Máy chiếu mini.